Grab your umbrella and join best-selling author Bill Bryson for a grand tour through the heartland of the United Kingdom. As he wanders through tiny villages and bustling cities, his irreverent travelogue will keep you laughing out loud and eager to explore what lies just around the next corner. 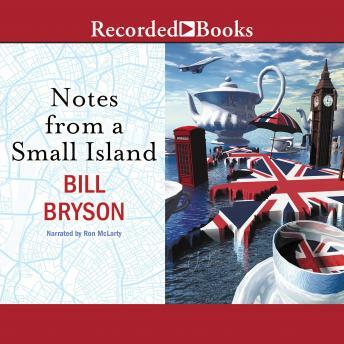 Before he returns to the United States after nearly two decades on British soil, Bryson decides to take a farewell jaunt through his adopted homeland. But his plans to neatly traverse the island by foot, bus, and train are soon thwarted. On weekends, odd train and bus schedules leave him stranded in isolated communities with damp, moldering inns. And as a destination beckons above the rooftops, a maze of city streets leads him further away. Amidst the difficulties, Bryson encounters quirky age-old customs, charming architecture, and salt-of-the-earth inhabitants. His uproarious social commentary and Ron McLarty's warm and witty performance will leave you feeling as if you have actually been travelling across the enchanting island.